On September 26, 2018, Corporate Council on Africa (in partnership with BCIU and the Chamber’s U.S.-Africa Business Center) hosted South African President Cyril Ramaphosa and a group of prominent American companies at an event to promote investment in South Africa on the sidelines of the U.N. General Assembly meetings in New York. CCA President Florie Liser made opening remarks at a CEO Roundtable to discuss specific investment concerns, and later made remarks kicking off an investment panel moderated by South African Trade Minister Rob Davies and attended by nearly 200 participants which focused on doing business in South Africa. Also participating on the panel were the US Chamber of Commerce and BCIU. President Ramaphosa briefed CCA members in attendance on South Africa’s recently announced stimulus package, stressing the importance of attracting more U.S. foreign direct investment to support job creation and a more inclusive economy. He acknowledged that South Africa has a number of challenges to resolve, including tackling corruption and making government policy clearer and more consistent. He briefed companies on recent measures he has implemented, including making it easier for companies to get visas, and addressing company concerns about the draft mining charter and concerns on the draft minerals and petroleum law. President Ramaphosa also pledged to reduce the cost of doing business in South Africa, for both foreign and domestic firms. He also spoke of the importance of key infrastructure needed to promote South African growth and announced the establishment of a 400 billion Rand ($27.5 million) Infrastructure Investment Fund, which will aim to produce “shovel-ready” projects. President Ramaphosa invited U.S. companies to do more business in South Africa, applauding the fact that 800 U.S. firms are already present, employing more than 250,000 South Africans, and accounting for 22% of inbound investment into South Africa. 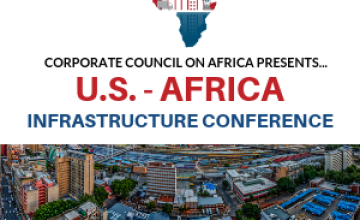 He welcomed the news that CCA will host its U.S.-Africa Infrastructure Conference in Johannesburg November 5-6, 2018. CCA is already working with his team to follow up on specific opportunities in aviation, energy, agriculture and pharmaceuticals.